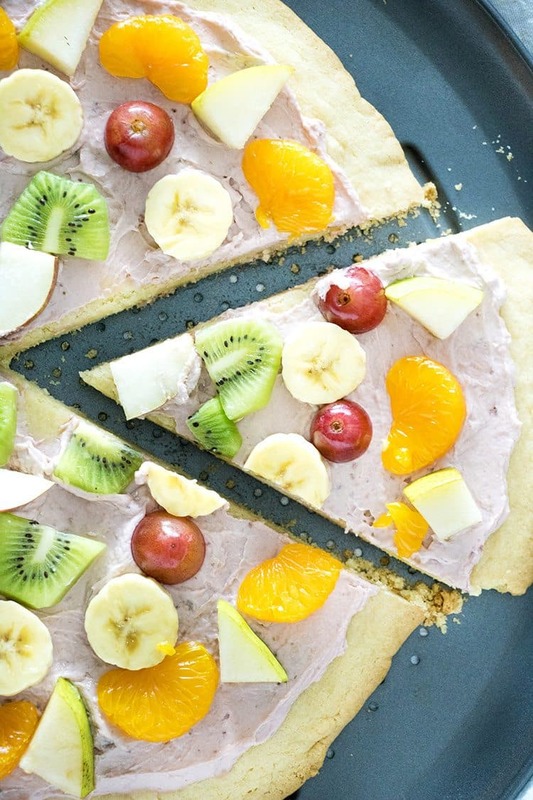 An easy to make fruit pizza with a soft sugar cookie crust, topped with sweet strawberry cream cheese and colorful winter fruits. 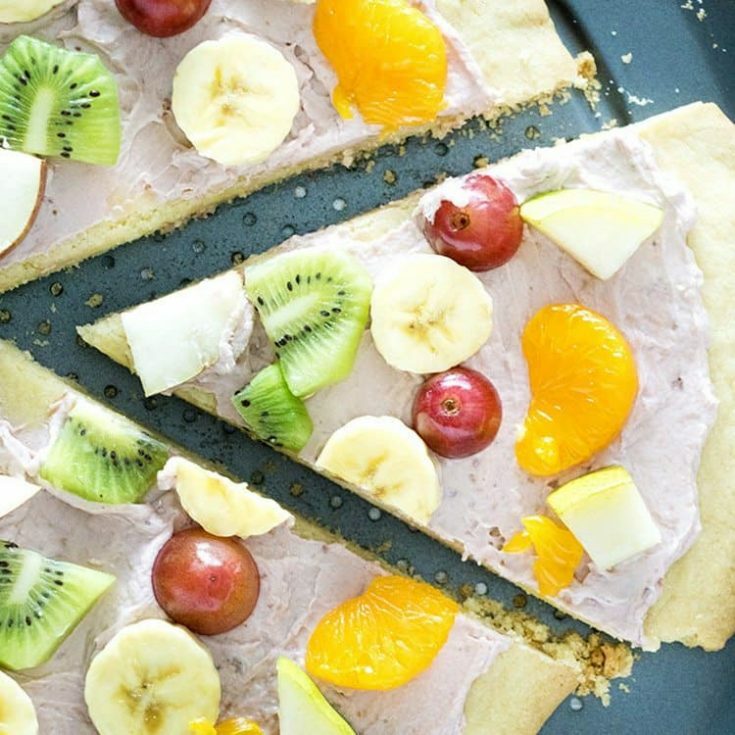 Fruit pizza always takes me back to my childhood and summer time. I think as a kid it was extra awesome that I was getting to have some soft amazing sugar cookie action with my fruit. Honestly, it still is! Yes, I’m one of those people that feels less guilty about treats like this because I’m still getting a full serving of fruit! The problem is, WINTER. It’s a sad time for fruit in my neck of the woods, period. So, I wanted to find a way to make fruit pizza that was just a good as the berry filled summer version, using produce that I can find in season. Oranges – citrus is always best during the winter! Another fruit that is amazing on this pizza that didn’t make the list is Pomegranate. If you are lucky enough to find them, please have some for me! Every single one of our grocery stores has been out of Pomegranate for a month now! So sad you guys! Keep it simple and use the pre-packaged strawberry cream cheese here. Underneath all of our tasty winter fruit is some decadent strawberry cream cheese. Keep it simple and use the pre-packaged strawberry cream cheese here. I love it because I don’t have to dirty another bowl for an already simple recipe. I also adore it because the pink color adds in some pop so that the lighter colored fruits really stand out and look beautiful. Let’s talk about this cookie crust! It’s a quick ten minutes to make, giant sugar cookie, basically. It will brown just a touch at the edges for just a little chewy texture, then be pillowy soft in the middle. The cornstarch is a must to keep your crust from spreading too much. Don’t try to spread this crust out to fill up your entire pizza pan either. You’ll want to leave a good 2-3 inch border so that it doesn’t come spilling over the sides of the pan. The next must is chilling the dough. Thirty minutes is completely sufficient. But, if you want to make this ahead, just place the dough in a covered bowl in the refrigerator overnight. After your 30 minutes wait time is up, you can simply flatten the crust right on to the pizza pan using your finger tips, no rolling pin required! Let it cool down completely before you add the cream cheese and fruit to the top. If you are more organized than me, you can stick the crust in your fridge to get it cool faster! If you’re like me, you can’t possibly fit another thing in your refrigerator anyway! Either way, this one is worth the wait! Enjoy! In a large bowl using hand held mixer, or stand mixer fitted with paddle attachment, cream together the butter and sugar until light and fluffy, about 2 minutes. Add in the egg and vanilla, beat on low speed until combined. In a medium bowl, whisk together the flour, salt, baking powder, baking soda, and corn starch. Turn your mixer on low and slowly add the dry ingredients to the butter mixture, beat on low for about 1 minute, just until combined. Cover the bowl of dough with plastic wrap and refrigerate for 30 minutes, up to one day. Preheat oven to 350 degrees. Butter a 12 inch pizza pan or spray liberally with non-stick cooking spray. Remove dough from the refrigerator and press down onto pizza pan in an even flat circle. Bake for 16-18 minutes, until edges are just slightly golden brown. Once crust is cooled, slice all of the fruit as desired. Top the crust evenly with the strawberry cream cheese, and decorate with chopped fruit. Note: You can store this in the refrigerator for 2 days after assembling, some fruit, such as bananas may not retain their color and are best added when serving. Nichole Clevenger is the blogger, and publisher behind The Salty Marshmallow. She enjoys being creative in the kitchen by developing original recipes, food photography, and she is especially passionate about baking. You can find her on Facebook, Pinterest, Instagram, and Twitter.